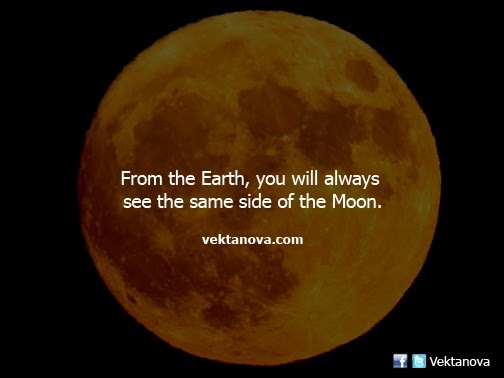 Because its rotation is equal to its orbital against the Earth, so you will see the same side of the Moon. The Moon has a locked face orbit and actually has no its own rotation, but it gets one by going along the Earth's rotation. Again, the Moon has no orbital velocity to going around the sun, the Earth drags it along on its orbit to make an orbit against the Sun. The locked face orbit means like a ball as the Moon being tied to a string to yourself and you as the Earth spin yourself, the Moon will follow your rotation with the same front side and there is no way for the ball to rotate by its self to show its back side, simply, the front side is locked towards your body. No response yet to "From the Earth, You Will Always See the Same Side of the Moon"